Wear Dated Carpet, originally uploaded by marit79. Here is a blast from Wear-Dated's past. As described in What Trail Does Your Brand Leave?, this photo captures our brand trail: a suggestion of our old logo, and a reminder of how we used to refer to ourselves. We used to be known as Wear-Dated carpet, but evolved that to Wear-Dated carpet fiber. See, we don't make carpet, whereas we do make fiber. Much more straightforward, accurate and relevant to change the reference. I'm not sure what the story is behind this photo. It is part of a photo set on Flickr titled "Chicago", but where in Chicago? It looks like it comes from an inside space and someone has been maintaining it. Do you see what I saw in this photo? I know it's not the best shot, but I sure giggled when I sat down for dinner in Aberdeen, NC and noticed that.... the Mouse had been there. A group of us had gone to visit Gulistan Carpet Mills. They have developed some beautiful new carpet styles made with our new Wear-Dated Natural Nylon carpet fiber, and we were looking forward to an intense marketing session. Now, Aberdeen North Carolina is not the largest place in the world, although it has history and a lot of charm. A big claim to fame is being located so close to Pinehurst, NC. I felt like Sherlock Holmes deep in pursuit of a trail. Where there others? I wandered around and quickly came upon an alcove filled with memorabilia. The most intense collection of GI Joes I have ever seen. And ... a shelf with a multitude of Mickey Mouse related items. This trail started for me with I Have Met The Mouse. Something tells me that I am far from reaching the end. After all, I've even started looking for the Mouse in the clouds! 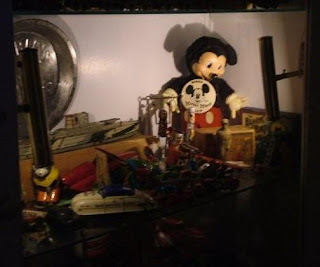 Going back to the Mickey in the alcove, isn't it fascinating to observe how Mickey has evolved over the years? The connection remains strong, but he has definitely changed to remain relevant to the time and place we live in today. I wonder how different he will look 30 or 40 years from now? What about your brand? How is it evolving? Does it create a similar brand trail? Do your customers encounter signs of you in unexpected places? Do they look for signs of you? And, do they then think of you with delight and come back to you asking for more? Hat tip to Sandy Renshaw and ImageChef for this celebratory image! Celebrations of happy milestones - like births, graduations, weddings, store openings - tend to be a big deal. Not only from a personal perspective, but also from a larger perspective. The birth of Flooring The Consumer took place on June 27, 2006, and - as when my daughter was born - I have been keenly aware of each monthly milestone. Twelve months originally seemed so far into the future, and, yet, here it is. As with my daughter's, I have learned from Flooring The Consumer's milestones -- especially since so many of them happened because of YOU who helped, encouraged, contributed, challenged, commented, subscribed and read! Thank you, Liz Strauss and Tom Vander Well. Flooring The Consumer is in unbelievably company! I proudly display your badges! This blog journey has been filled with the unexpected. Yet, I think it has only just begun! I expected it to be anonymous, rather than personal as Toby Bloomberg, Liz Strauss, Harry Joiner, Matt Dickman, Mark Goren, Lori di Magno, Marijean Jaggers, Kristin Gumper, Mary Hunt and Yvonne DiVita demonstrated. I expected it to be distant. But, CK, Valeria, David Reich, Steve Woodruff, Fard Johnmar, David Polinchock, and Lewis Green proved otherwise, making it quite local. I certainly didn't expect it to be so global as Reshma Anand, Laurence Helene Borel, Katie Chatfield, Daria Rasmussen and others have made it. I never expected to find as much early encouragement as Mike Sansone [get better soon! ], Maria Palma, and Drew McLellan shared with me. I never expected the Bathrooom Blogfest '06 to be as much fun. Thanks, Stephanie Weaver and Susan Abbott. 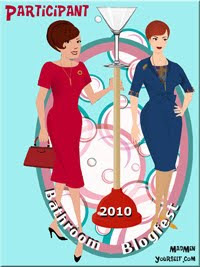 Anyone [especially women bloggers] interested in participating in the upcoming Bathroom Blogfest, please let Stephanie and Susan know. I guarantee that it will be a blast! I hoped for inspiration, but found much more than I ever could have hoped for from Tammy Vitale, Elizabeth Perry, Robyn McMaster and others. I only dreamed about roping in my associates, and yet Marianne Cone willingly contributed multiple articles and photos, as did several of our Wear-Dated Representatives. And, then, there have been unusual blog experiments [e.g., the Z List and the 2000 Bloggers], as well as serious ones [Todd And's Power Marketing 150, Viral Garden's Top 25 Marketing Blogs, the Graduates E-Book and the soon to be released Age of Conversation project that Gavin Heaton and Drew McLellan have masterminded]. I expected this to be a solo journey, and have instead discovered a vibrant community that stretches around the world like a silken spider's web. I expected this to be somewhat of a chore. Instead it is a source of constant delight, adding dimension and additional perspective, for example, to MarketingProfs.com webinar sessions with David Armano and Greg Verdino, and many others. And - although I hoped - I wasn't sure whether the flooring community would embrace Flooring The Consumer, and yet it has. In fact, in the same issue of FCW that 'Welcome to My Home' appears, Chris Ramey from the Florida Luxury Marketing Council identifies me in his article as a 'thought leader' alongside several others in the industry I respect greatly. Wow! This has been an awesome first blog year. It sets the stage for the next one during which I promise a flooring related meme! Intensely jazzy flooring toe taps of delight underscore how happy I am to be involved in all of this. To recap, it all started with I Have Met The Mouse when I witnessed firsthand the amazing Disney attention to details... And then, In STORY Brings Brands To Life, we got a taste for the Disney Institute teachings on customer experience. 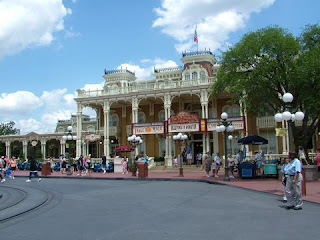 We started out looking at the experience from onstage, as a visitor first enters the Magic Kingdom. Think of it, the visitor enters from the real world -- having possibly just come off a bus, a boat or a train -- to enter into a fantasy world. This is the equivalent of a transition or decompression zone in a retail store. The visitor must produce a ticket, get his/her bearings, maybe a map, worry about practicalities [bathrooms, lockers, etc.] before being able to fully take part in the fantasy. Visitors go through turnstiles to enter the Kingdom [I was astounded at the level of security throughout the properties: big vehicle barriers, security walk-throughs on buses to check bags...]. Although the process is electronic and mostly automated, Disney has Greeters by the turnstiles to welcome people, often waving a Mickey Mouse hand. Interestingly, Disney experimented with having no greeters, but learned that this negatively affected the experience. To the right of the turnstiles are lockers, wheelchairs and various sundry items. Entering into the Kingdom [see #1 on the map] through the train station takes you officially to fantasy land. Rob likened it to walking through the red velvet curtains of a stage: on the other side, it's showtime! First clue that we are onstage comes from the sidewalks: they are red. After consulting with Kodak, Disney learned that the best background color for a perfect picture is red. Consequently, the sidewalk is red for better photo contrast in all of the public spaces. 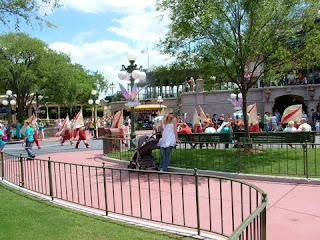 No surprise, large crowds visit the Magic Kingdom on a daily basis. That crowd enters with expectations... and Disney World must meet and/or exceed those expectations. Cleanliness ranks way up there. As a result, trash cans are placed every 27 steps. [In this photo, you can see 3.] This encourages guests to participate in keeping the park clean [cast members - including Rob - also relentlessly pick up trash]. However, at the exit [i.e., the train station] structures are built to scale so the exit looks closer on the return trek when everyone is tired and cranky. Isn't that clever? Now, that means that perspective has to be maintained relentlessly which includes making sure that all of those garbage cans - every 27 feet - line up perfectly across the street from one another. Disney pays attention to visitor mood changes depending on time of day and stage of visit. At the beginning of the day, music is bright and bouncy, filled with energetic anticipation. At the end of the day, when everyone is exhausted and overloaded, music is quieter and more subdued. Cast members, too, use a different tone and message depending on the daypart. During our visit, we witnessed the pre-parade activities with high school bands playing. Schools consider it a big honor to perform in the Magic Kingdom and the selection process is intense. Bands pay Disney to participate; they must audition and generally prove that they meet expectations. I thought this scene was priceless: this young girl got to be crossing guard for the day. I can't remember how kids get selected for this, but she was on cloud 9 directing traffic. What a clever and easy way to make your visitors, clients or younger constituents shine! 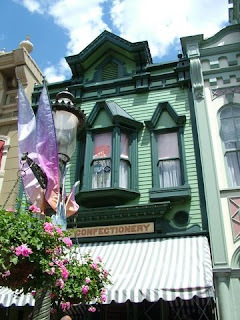 Architectural details are delicious - all true to a Main Street, turn of the century [1900s] Americana scene. Disney pays lots of attention to maintaining the integrity of fantasy, down to the message tip board. The tip board came out of a "BFO" [blinding flash of the obvious] according to Rob. 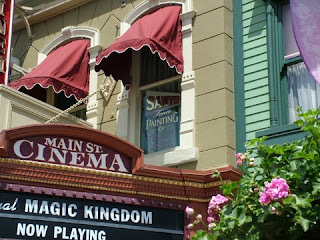 It provides information to visitors at a point of divergence in the Magic Kingdom. Now, it cannot be an electronic or digital message board. 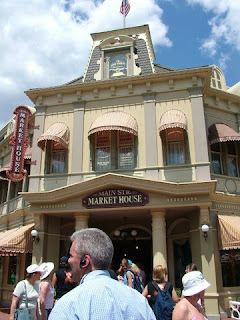 That would be untrue to the historic Main Street time frame. So, it is updated by hand every 10 minutes. Updates come via radio. 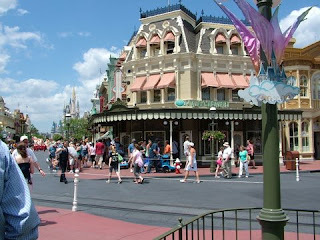 Main Street in the Magic Kingdom has a distinct "real feel" that Rob referred to as Storybook Realism. By the way, this level of realism includes smells. Disney pumps many smells into the street to add to the legitimacy of the experience -- from horse manure to baked goods outside the bakery [we even got to see the bakery compressor when we went backstage!]. Every window features names with stories that interconnect with other stories. No one can have a name [or story] attached to buildings unless they 'move on' [literally or figuratively] and have contributed significantly to Disney. Note in the photos that many store doors are open to the outdoors - to express courtesy, and extend a welcome to passersby. If no one is in a store, cast members are encouraged to step outside, wave a Mickey hand and otherwise interact with visitors. Ever aware of its audience base, the Magic Kingdom offers many 'Grab and Go' meals, realizing that visitors are looking to maximize their visit. I experienced the Disney Photo Pass in Halloween Bathroom Horror Stories at the Disney store in Manhattan. Anyone photographed by an official Disney photographer receives a card with a barcode on it to group any photos taken and make them easily available online. It eliminates the need to wait in line and generally puts the photo experience in the hands of the visitor. Per Rob, 80% of merchandise sales take place at the end of the day. Disney enhances the experience by delivering packages to the front of the park or offering package express service to further eliminate the hassle factor. It also improves efficiency overall. - What about smokers? How do you adjust the smoking policy? Smokers now have a dedicated area. 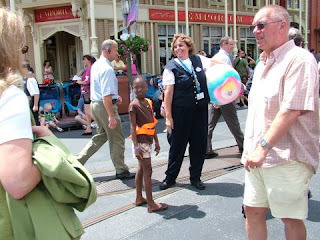 - What about making sure that cast members don't get too hot? Very important and front line leaders actively monitor. They worry about creating a positive experience for cast members, too. The Town Square showcases a statue of Roy Disney on a bench with Minnie Mouse. 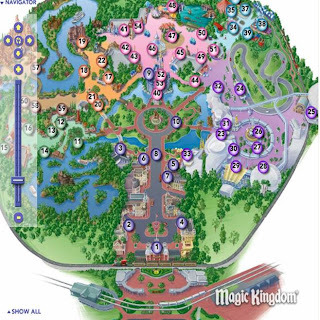 This acts as a visual reminder of the Disney values, and helps keep cast members focused on making the right decisions and preserving the magic even when discussing how reality makes the fantasy possible [Rob used the example of Tinker Bell zooming out of nowhere on a cable. The magic of that appearance MUST be preserved]. Then, we moved backstage. The first visual cue comes from the sidewalk: it switches to concrete. Immediately, we noticed banners promoting messages: "I can make a difference: project a positive image, go above and beyond. " These need to be simple and fresh to get noticed. 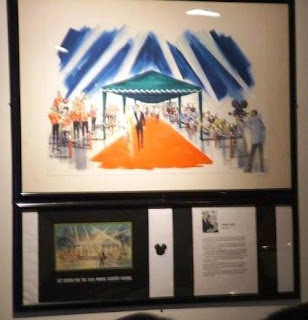 Backstage includes the "Tunnel". It seems to be underground, although in reality it is above sea level. Nonetheless, it is beneath the Magic Kingdom and allows cast members to efficiently move around without affecting the fantasy, without interrupting the theme. Underground is where cast members are allowed to be real, to behave differently, to relax. Even the music is different, having nothing to do with the theme music above. This is where they have "down time" - critical to sustaining their fantasy role over extended periods of time. If they can't do that, maintaining the facade in front of guests becomes increasingly difficult. Everyone wears a name tag and is on a first name basis. That and the hometown create discussion. When Disney first introduced the concept, it was unheard of. Pins appeared as part of the millennium celebration 2000; they are a big deal in Europe and are becoming so in the U.S. Disney now encourages cast members to trade pins with guests. To avoid problems, cast members wear a green lanyard to trade with kids, and a blue one for adults. Main Street includes a firehouse which displays real firehouse patches. However, to preserve the happy fantasy land aura, it now displays a series of 9/11 patches in the tunnel as they are too sad and real to include above ground. However, Disney does now fly flags at half mast now, even though that captures reality and detracts from the fantasy. They did it first time when Challenger exploded. Rob showed us many programs focused on honoring and recognizing cast members. For example, the Partners in Excellence Award is peer nominated and peer selected based on three criteria: guest satisfaction, business results and peer excellence. No cash, but highly coveted. People are starved for recognition. It's critical to express a sincere 'thank you'. Interestingly, no formal performance appraisals are in place because of the complexity of administering them across a multitude of unions. Instead, Disney conducts daily performance assessments as a result of leaders spending 70% of their time on stage with cast members. Turnover in Florida ~20%. Disney looks to hire people who express a strong connection to the brand and to the culture. In fact, they worry if someone wants to be there just for the money! Some jobs are specifically designed to be short-term. Disney truly wants its managers to be out managing cast members and delivering the best possible experience to visitors. Although it has 17 unions on property, it has instituted a new concept referred to as deployment base to centralize and automate scheduling and allow managers to manage. 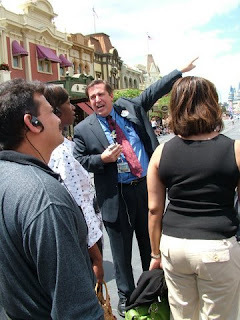 Rob explained the emergency preparedness plan [remember that Disney is committed to visitor safety]. On 9/11, it emptied the theme parks in 1.50 hours. Disney engages all of the senses to enhance the onstage fantasy. It uses a variety of communication tools. It pays incredible attention to details because guests will notice perfection. It uses every opportunity possible to reinforce the brand including through behaviors and details. It hires for attitude rather than for aptitude, looking for those with an affinity to the brand and the culture. It has created an extremely successful, well defined, clear to all, by design/by specific intent corporate culture. That culture intends to stay true to its heritage and traditions. The goal is to create an experience that generates such emotions that no one minds purchasing it [and all of the memorabilia!]. Nothing about the Disney experience is commoditized. Rather, it is unique! Emotion plays a critical role in driving that marvelous experience. This taste of what makes the Magic Kingdom so magical can be successfully deployed outside of Disney World to any retail environment. Attention to details, expressing a passion for the customer experience, a true commitment to creating a memorable unique interaction.... It is all possible given the right focus on STORY. I've been experiencing flooring toe taps of exhilaration all day long. 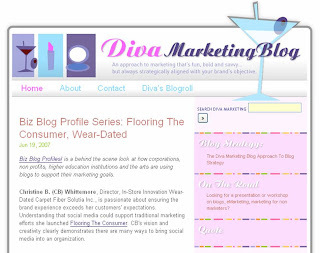 Diva Marketing's Toby Bloomberg [a.k.a., The Diva] has just granted me the ultimate honor by showcasing Flooring The Consumer and Wear-Dated in her Biz Blog Profile Series: Flooring The Consumer, Wear-Dated. Toby had me thinking about old marketing and new marketing and how to create a bridge between those two worlds. And, now, I'm curious. What are your thoughts on how best to extend the blogosphere conversation beyond keyboards and blog relationships -formed as a result of our musings- to draw in those who don't know about blogs, or aren't yet comfortable with the world of 2.0? As actively involved as we are in this medium, a whole wide world out there isn't yet engaged as Lewis Green has brought up in Web 2.0 Reality Check. So, how do we extend the conversation? To that point, we call it conversation, but Liz Strauss grounded me when she brought up the perspective of Her Friend Peg - who is not part of the blogosphere - who doesn't get all of this 'conversation' talk. To her, it's more of a traditional one-way exchange as in a newspaper publishing an article. So, how do we draw others in? 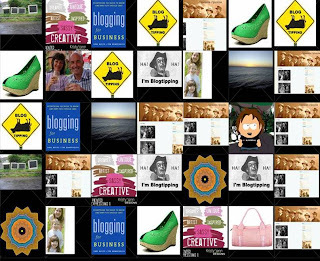 Now, Lewis Green also brings up in The Art of Blog Marketing that "marketing is about creating connections." So, how do we extend these connections? How do we invite others to participate?How do we share our wonderful ideas and concepts, our collective knowledge that illustrates the The Wisdom of Crowds ? Sharing the message with one person at a time matters greatly. And, bridging old marketing tools with new ones helps tremendously to make the new ones not seem quite so intimidating. But, how else are you doing it? What can we learn from one another? In many ways, the B2B world that Valeria Maltoni will soon be joining [Congratulations, Valeria!] is an ideal one for creating the sense of community and connection that thrives in a web 2.0 environment. Mike Sansone aptly brings this to life in ConverStations. So, there most definitely is a way to extend the art of blog marketing to all those wanting to bask in the connections. What are your success stories? Thank you, Toby - most gracious Marketing Diva, for this honor. Marijean Jaggers from StlWorkingMom took me completely by surprise last week when she awarded Flooring The Consumer a Thinking Blogger Award. As Marijean notes in her post, she works for the Standing Partnership, the PR firm that corporate Solutia [my company] works with. She and I finally started talking/emailing after Sue Cannon, our common Solutia contact, urged us to talk. I was certainly eager to do so as Marijean not only has podcasting experience, but is equally intriged with social media newsrooms! In the process, though, we clicked - that's the magic of the blogosphere - and I hope to hook her up with my niece who will be atttending University of Virginia Nursing School in the fall. Thank you, Marijiean, for this honor! Getting back to this wonderful award - I was curious as to the origin of the award. After a little research, I came across Ilker Yoldas' blog titled The Thinking Blog and the post announcing the Thinking Blogger Awards. It's an antidote to memes that don't necessarily relate to a blog's mission... How fascinating! - Liz Strauss from Successful and Outstanding Blog whom I met while in Chicago last week and whose conversation continues to percolate in my brain. Who makes you think? Who turns the world upside down for you so you see it from a totally different perspective? Definitely totally full to almost overflowing! Tom Vander Well from QAQNA recently tagged me in Is Your Glass Half-Full? referring to Ramblings From a Glass Half-Full's Terry Starbucker and What's in Your Glass (The Starbucker Meme)? 1. How full is your glass? 2. What kind of glass is it? 3. What's in the glass? 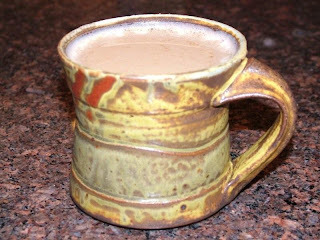 For #2, well, my glass is a carefully crafted ceramic mug created by my husband. He's a potter and pays careful attention to shape, weight, balance, texture and the overall visual aesthetics. I like a lot of coffee at the beginning of the day, so this mug holds the right quantity without being too heavy. My reasons for all of the above? Morning sets the stage for the whole day which I see full of possibilities - ideas to absorb and share, gnarly issues to unravel, delightful surprises and unexpected improbabilities. The more I engage all of my senses, the faster my brain gets into a groove. 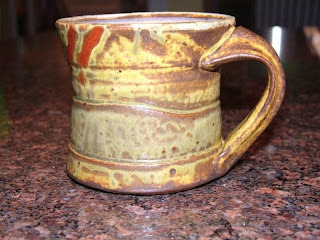 So, holding my husband's mug in both hands, feeling the surface texture, while inhaling the smell of caramel coffee and admiring the abstract glaze patterns offers me a full sensory experience in anticipation of endless possibilities for the day! I wonder what Brain Based Biz's Robyn McMaster would say? For a marvelous visual interpretation of Starbucker's question, do visit Elizabeth Perry's woolgathering: half full. And, consider letting me know whether your glass is half full or half empty. How would your customers describe your glass? Would the two match? Laurence-Helene from Blog Till You Drop! Neptunian world originally uploaded by Krispy-Kris. Innovation truly matters. When done well - by radically simplifying and maximizing value for the customer - it leads to Blue Oceans, as we learned in Part I of Francis Gouillart's discussion, Innovating with Blue Ocean Strategy and Experience Co-Creation. This next part in Gouillart's presentation focuses on Experience Co-Creation - or involving the customer in defining or creating the value to focus on, first from a strategic perspective, and then at the process level. Progressive first created a Blue Ocean around the accident site experience by sending its immediate response vehicles complete with adjuster to the accident scene. Not only did a branded Progressive vehicle make a strong visual splash at the scene, but the adjuster was prepared to settle accident claims at the accident site thereby eliminating [or at least minimizing ] the accident 'hassle-factor'. In the process, Progressive generated value not only for the consumer, but also for itself. And, since each accident is unique, elements of co-creation were taking place in that value creation. From Progressive's perspective, its presence at accident sites helped prevent fraud schemes. It learned what truly matters to customers after an accident and reduced loss payments by not having to involve doctors or lawyers in the settlement process. The customer appreciated that hassles were reduced at the distressful accident scene [noteworthy particularly from an industry that tends to create hassle rather than eliminate it]. Progressive acted more like a friend [showing up in person] than a faceless organization and quickly took care of details. It also decreased accident costs by not forcing the customer to call a doctor or lawyer and creating an environment of trust and transparency around the settlement. NOTE: the notions of trust, fairness, transparency play a big role in successful co-creation. Progressive further innovated the repair/claims settlement experience through a breakthrough concept called concierge service. Customers could now entrust repairs and claims settlement entirely to Progressive via an easy and transparent concierge level of claims service that involved the customer in creating the solution to fix the damage. This, again, captured value for both parties. For Progressive, it learned about customers' preferences during the claims settlement process, helping them manage a strong network of repair shops and health care providers. It reduced repair cost overruns by not having to absorb unexpected surprises often revealed during repairs. For the customer, not only did Progressive create an easy and transparent repair process, but it let the customer be in control. Progressive acted as an advocate within the repair network without forcing the customer to accept a second rate solution. The result: approx. 90% customer satisfaction ratings. Once again, both parties benefited. Progressive gained a broader perspective on the marketplace, understanding better how quotes trigger action. It learned when it won vs. lost so it could modify offerings and improve close rates. It also tapped into a larger pool of applicants, allowing it to better select risk better and lower loss ratios [i.e., risk profiling]. This dramatically decreased the cost of market research and of attracting new customers [i.e., less switching and more word-of-mouth endorsements]. The customer saved considerable time by getting direct quotes online, easily comparing other options, and not over-paying out of ignorance. For those customers who preferred to purchase their insurance through agents, Progressive also offered an improved experience, benefiting all three parties. Not only did it reduce its own costs in interacting with agents, but it also those of agents through Drive Advantage. Customers appreciated that they could choose which channel to obtain insurance from. Through Drive Advantage, Progressive attracted better agents; it gained better market and customer behavior knowledge. Progressive reduced processing costs because agents enrolled in Drive Advantage used Progressive's technology tools. What a way to create a competitive advantage! On the customer side, Progressive willingly accommodated customer preferences and ensured that, whichever the choice, quality remained at the forefront. Any additional costs represented peace-of-mind and time savings for the customer. The latest innovation allowed Progressive policyholders to collect and share data on their driving habits TripSense to qualify for a discount at renewal time. The customer completely controlled the process. TripSense may track the data, but the customer reviewed it and decided whether to share it. Interestingly, through TripSense, Progressive had the beginnings of community. For parents worried about their children, the tool generated data to coach them into becoming better drivers. Good drivers were rewarded through a discount [i.e., greater fairness in pricing], while Progressive reduced its claim losses. The data was priceless. Having access to detailed driving records allowed the company to better understand what drove accident and claim costs, how to improve underwriting and pricing criteria, and how to reduce overall claims cost by understanding driver habits and increasing the likelihood of attracting better drivers. 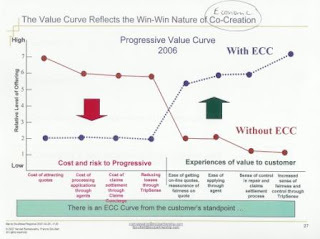 As you can see from the value curve to the left, Progressive created an amazing win/win proposition through economic co-creation. Experience co-creation at a strategic level was not only powerful in delivering value to the customer and generating intense loyalty, but also delivered a deep Blue Ocean. Let's take it to a different level. Co-creating a new experience at the PROCESS level is also powerful as the following examples illustrate especially in gaining market insight and building communities. The most powerful example of how co-creation leads to powerful market insights come from Dell and its abysmal fall into Dell Hell created by its terrible customer service record. Jeff Jarvis' BuzzMachine brought it to people's attention and -eventually- to Dell's. Their initial reaction was denial, then anger, and finally acceptance. Dell has created its own blog to address consumer issues [Direct2Dell] and engaged in robust interaction with its consumers, learning a great deal about the marketplace in the process. Another example comes from Starwood Hotels and its aloft hotel in Second Life where it invites Second Life residents to participate in the design of the hotel. This represents an extremely different approach to conducting market research. Although a test concept, Aloft - when it opens in real or first life - will be the product of co-creation. In terms of building communities, Gouillart brought up TripAdvisor. It's the largest online travel community. It's totally transparent, offering real traveler perspectives on hotels. Photos, comments, experiences provide a check on otherwise lofty and unrealistic marketing materials. Feedback occurs instantaneously. It's totally authentic because the community believes so strongly in the value that it provides through truthful reviews. Another example consists of a 'different kind of travel agency'- ClubTourism which co-creates events and trips. Established in 2004 primarily with on older Japanese populations [particularly women] in mind, it now numbers 7.6 million members. It differs from traditional travel agencies in that it focuses not only on the trip, but also on the before and after. In so doing, it creates clubs with a 'travel friends circle' feature and has led to the propagation of additional clubs. Having examined how experience co-creation leads to Blue Oceans, it's important to realize that customer value is defined by experiences and not by products and services. The products and services may be important, but what truly matters is the experience we deliver to our customers as they consider the product and service options we offer. Further, the experience customers have comes from the interactions with us, not from our processes. The beauty of interactions is that they require co-creation, by their very nature. Because each interaction is unique, it cannot be staged or made predictable. However, our processes set the stage for the interaction and for experience co-creation. So, to start on this journey, consider opening up ONE customer facing process [e.g., call center, sales process, design, ...] to co-creation, and then the rest will follow. Blue Ocean originally uploaded by kater_wg. Innovation. Trying new approaches to the tried and true. Keeping an open mind. Nurturing Creativity. It really matters. On the personal front as well as in business. 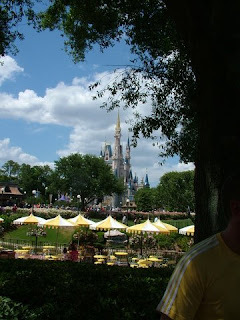 Back in April, I shared I Have Met The Mouse and STORY Brings Brands To Life, a result of a magical DisneyWorld day courtesy of Maritz, that included a half day session with the Disney Institute. As fantastic as the Disney Institute part of the Maritz meeting [observations from our field trip to the Magic Kingdom coming soon], what really sparked my imagination was listening to Francis Gouillart, President and Co-Founder of Experience Co-Creation Partnership, best-selling author and leading authority on strategy, and innovation [and intensely involved in INSEAD and the University of Michigan]. Gouillart, in his presentation, addressed Innovation from the perspective of the Customer's Experience and the invaluable role that "Co-Creation" [i.e., involving customers in the creation of value] plays in identifying distinct points of competitive differentiation. Take that one step further and Experience Co-Creation becomes the process through which one arrives at a "Blue Ocean", based on the book Blue Ocean Strategy: How to Create Uncontested Market Space and Make Competition Irrelevant by W. Chan Kim, Renée Mauborgne from INSEAD, to which Gouillart contributed, about creating truly innovative businesses. Per Wikipedia, blue oceans represent "untapped and uncontested markets, which provide little or no competition for anyone who would dive in, since the markets are not crowded. A "red ocean", on the other hand, refers to a saturated market where there is fierce competition, already crowded with people (companies) providing the same type of services or producing the same kind of goods." The traditional approach to innovation wants to keep adding, which adds cost, further segments the market into a smaller customer base, and doesn't add comparable value. It's much better to SIMPLIFY. Take Cirque du Soleil. Is it a circus? Well, in some sense yes. But, it has done away with animals [50% of the cost structure]; it eliminated star performers [another 20% of cost], reinvesting in magnificent costumes, unusual music, brilliant choreography. It borrowed from theater to tell a story. The end result is something totally different, in its own category and that viewers value highly -- enough to pay a significant premium. 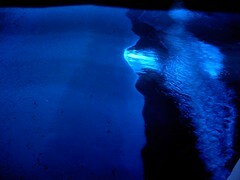 In other words, Cirque du Soleil has created a Blue Ocean. It has built differentiation based on distinct value elements. 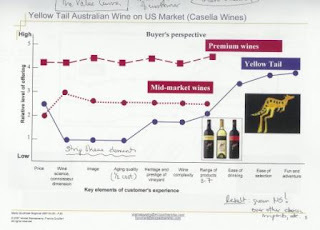 Yellow Tail represents another example: a casual Australian wine offering simplicity and consistency via few choices, an innovation in a market where complexity and inconsistency are the rule. The result is that Yellow Tail has grown market share in a short period of time, without significant advertising expenditures, over a multitufe of better advertised other choices, imports, etc. Critical to building a Blue Ocean is creating a VALUE CURVE that looks at value through the eyes of the customer. It's not about the product benefits or the manufacturing benefits. It's about what matters to the customer. The traditional value curve for premium wines ranks all of these elements high and on a similar level; for mid-market wines, medium. But, for Yellow Tail, price is slightly above mid-market, wine science/connoisseur dimension, image and ageing quality are stripped; heritage/prestige, wine complexity and range of products [3 to 7] are mid/low, and ease of drinking, ease of selection and fun/adventure extremely high! [ 3 elements that don't even factor into traditional wine experiences!]. Formule 1 breaks the hotel paradigm of the 'etoile' [star] rating system for hotels. Formule 1 is a low budget french hotel owned by Accor Hotels [also owns Motel 6 in US]. Traditional hotel chains offer a relatively similar ranking across all of those elements, higher for a 2 star hotel, and lower for a 1 star. Formule 1 on the other hand offers no eating facilities, zippo in atmosphere or architecture; room size is based on the Japanese model; imagine a self-serve kiosk [think self check-in at the airport] rather than a live receptionist, and relatively little in room furniture/amenities. However, those elements that do matter to the traveler [bed quality, the cleanliness of the rooms, and silence] have been pumped up dramatically, and the price closer to that of a 1 star hotel, but significantly below that of a 2 star hotel. Again, this represents a value curve viewed through the eyes of the consumer where poorly valued elements have either been eliminated or significantly reduced and resources focused to significantly enhance highly valued elements. The full experience has been examined in terms of the customer's interactions with the "experience environment" [i.e., the company] to determine which aspects matter and which don't, to then create a solution where both company and customer win. Up to this point, we've looked at organizations where the company fully controls the delivery of the experience. Imagine, though, taking that one step further and involving the customer in the design of the experience. In other words engaging in co-creation to deliver a blue ocean. Today, though, we are seeing a world where individuals/customers are not only highly connected, but also extremely well-informed [often better than salespeople], increasingly active in the purchase process, and ready to make decisions. We no longer need or want to be passive recipients. We prefer to be a part of the process. We want the interaction with the companies we care about to be unique experiences. And, ideally, we want to be involved in the creation of that experience with the company [i.e., co-created]. Think Build-A-Bear. To illustrate, consider Sumerset Houseboats in KY, a manufacturer of custom houseboats. For years, customer satisfication hovered at 70%. Why? By analyzing the points of customer interaction, Sumerset decided to include a camera during the manufacturing process. It educated purchasers. It also gave purchasers a sense of pride of ownership. Customer satisfaction has increased to 90%. The camera concept created a platform for interaction and winds up benefitting both parties. For the company, it limits rework. For the customer, it means a differentiated customer experience. Another benefit that Sumerset sees is the creation of customer communities [think Harley Davidson] both on the customer end as well as the company side, decreasing marketing costs. The collective community becomes a source of R&D. Value increases and it's that much easier to sell more [think of iPod/iTunes where people sell the product, they talk up the benefits, create and share playlists, etc.]. The next installment in Innovating with Blue Ocean Strategy and Experience Co-Creation will look at co-creating a new experience first at the strategic level and then at the process level. Who doesn't admire Passion? It engages us and fires our imaginations. It leads to intense conversation; it draws others in. It's fun! It's contagious! Cindy Wilson, our Wear-Dated Representative for Orange County, CA, exudes passion on a multitude of fronts. In this case, it's about 'her' Angels. Here is her story, and - yes - there is a connection to flooring! There are some smells that just send me to my “Happy Place”: books in a book store, new crayons, fabric stores, plumeria and gardenia flowers in Hawaii, grass that has just been mowed... The ultimate is the smell of grilled hot dogs and just popped kettle corn which tells me that ahhhhh, it’s must be baseball season! And baseball season means that MY Anaheim Angels (notice that I am a little old school, no Los Angeles Angels of Anaheim for me!) are getting ready to play. I circle the date the pitchers and catchers report for spring training; I circle the date the rest of the players report; I circle the date official play starts! I vote for the All-Star players (All Angels, of course). I dust off my Rally Monkey, Angels jerseys -- one white with red and blue trim and one red with blue and white trim and both bedazzled with rhinestones! (I like baseball, but I am still pretty girly!) . I have a red watch and red deck shoes. My husband has his jersey and several Angels T-Shirts. I made fleece blankets for us and our (adult) children out of MLB Anaheim Angels fleece. Now, mind you, we live in Southern California. It is really hot most of baseball season. You may ask, who needs a fleece blanket in August? We absolutely do! The minute I walk inside the stadium, it's a marketing frenzy to engage, meet the immediate needs, stoke the future needs and generally extend the Angels magic for an average 40,000 people in attendance every night for the Angels. The days of baseball simply having ads along the outfield fence are long gone. They are still there, but not as prominent. Anyone entering Angel stadium at the Home Plate entrance sees two huge Angel baseball caps framing the entrance. The Angels Home Plate entrance also showcases the World Series Trophy immediately in front of the Angels Store. There you can buy everything Angels that you can think of: Jerseys and T-Shirts with your favorite player's name; caps, baseballs, baseball cards, bats, pictures, stickers for your car, even Rally Monkeys! Many games now have “give away promotions”. Fridays are Big Bang Fireworks from Wells Fargo Bank. Recently, we went to a game where everyone got a TY Beenie Baby Rally Monkey. In the next couple of weeks a clock shaped like an Angels Jersey will be the Wild Rivers Waterpark and KFROG-FM promotion. Memorial Day will have more Fireworks and a duffle bag giveaway by Frazee Paint and 102.7 KISS-FM. Walk inside Anaheim Stadium and the bright “ribbon” around the park flashes with bright colors. The names of former Anaheim Angel players appear and dance around the stadium. Fans cheer for their favorites of days gone by. Anaheim has 2 Jumbo trons in the outfield. The outfield also boasts a giant “A” made to look like a huge rock formation with a fountain. Anytime a player hits a home run on the Angels, fireworks shoot out from the fountain. 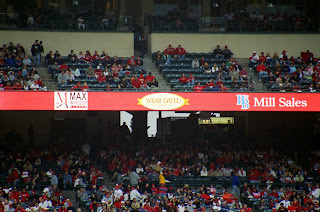 During the game, ads run on the ribbon. In between innings, at times, commercials will run on the jumbo tron. Arrowhead Water, Wells Fargo Bank, Hawaiian Airlines, Linder’s Furniture are some of the names that appear on the ribbon and move around the stadium. Mike Scioscia, the much beloved manager of the Angels and the former catcher for the LA Dodgers is the pitchman for Howard’s Appliances. The big screens are his favorite according to the ads, but you can get a fridge and a stove there if you really want them. 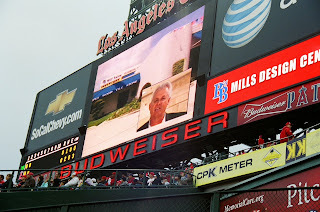 Two of the Jumbo tron ads feature former Angel players. One is Bobby Grich; he is in the commercial for Roger Dunn Worldwide Golf Shops. I don’t golf, but I know who Bobby Grich is and I remember the ad! The other is Bob Boone, former Angel catcher, 7 time Gold Glove winner who played 2225 games including 4 All Star Games. He's also owner of B & B Mill Sales [note: website BBMillSales.com is still under construction], a flooring store on 1700 N. Main St. in Orange, CA [Tel: 714.685.0060, 714.685.0070]. Bob opened this store with his dear friends, Bill and Jodi Case. They have a magnificent showroom with choices in every type of flooring that you could ever want: carpet, tile, stone, marble……. Would you like granite counter tops? They can help you! Need carpet tomorrow? They have stock. In the showroom, they have set up a beautiful living room -- nice leather couches, faux fireplace. Also, a working kitchen and eating area. Big screen TV. What would be playing on that TV? How about a game? As a fan of the Angels and the Wear-Dated Rep for B & B Mill Sales, I can truly see the value of a great player from my favorite team talking about my product. In fact, I patronize many of the places that advertise at the stadium. I have personally witnessed countless potential flooring buyers in the store, asking if Bob is in, if Bob could sign their baseball cards, jersey or pictures. 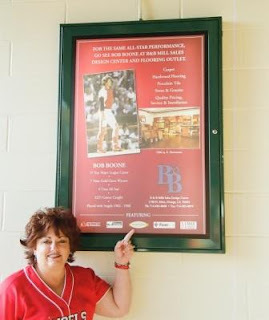 But, the best part of B & B Mill Sales is not only that Bob Boone might be able to sign your baseball card. It's also that the whole staff will make you feel that you are important to them. They will treat you like family…….Angels fan or not! Thanks, Cindy, for bringing the Angels magic to life for us all. 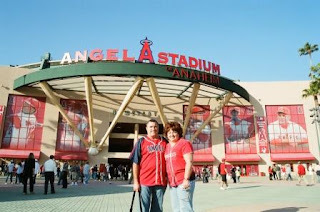 What strikes me [no pun intended] is the local aspect of Cindy's and other Anaheim Angels fans' enthusiasm. As large a community as 40,000 people per game, each shares a strong passion for all things Angels related. Any organization choosing to associate itself with the Angels must share that passion. It must exude it at individual store locations. In other words, it must 'walk the talk' [or rather 'play ball'?]. B & B Mill Sales certainly does, and we admire that! What do you feel passionate about in your business? How do you showcase that passion to your customers and engage them? Are you contagious? How has the book affected the evolution of the Loews Hotel customer experience? Did some examples/case studies hit home more than others? Which ones? Since my father and uncle opened Loews Hotels 65 years ago, we have seen so many trends come and go. We’ve also seen the industry expand to one of the most popular around the world as part of the growing travel and tourism industry. But the more things that have changed, the more things have stayed the same. In light of changing trends and expanding industries, we have always prided ourselves on our customer service record and understanding the needs of those who choose to stay with us, whether they are traveling by themselves or with their families, on a business trip or on a vacation. But we also have spent a great deal of time understanding who our customer is and what the brand Loews Hotels means in the minds of consumers. We discovered that we are known for our service and hence we have taken initiative to find ways to upgrade the service that our coworkers can offer. We instituted training programs, such as Living Loews and Genuine Personal Engagement, which give our coworkers the tools necessary to do their jobs. We are continually looking at other ways to support the brand and any brand extensions that can come from the Loews Hotels name. RE: the chapter on diversity. Some hotels have made a big effort in recognition of women's changing roles in business [and increasing work-related travels] to attract them. How is Loews reacting? Has that caused any friction and how have you addressed that? What about other non-traditional groups? We have always tried to ensure the safety and security of our customers while also understanding that, in this post-9/11 world that we live in, transparency has become a very important issue. So as it relates specifically to female travelers, we do everything we can to offer them the accommodations to make them feel comfortable and give them the opportunity to accomplish their goals for that particular trip. We also have broadened our understanding of the diverse nature of our customers by offering programs such as Loews Loves Kids, where we encourage our travelers to bring their families on business trips, in addition to vacations. We were also the first in the industry, in terms of a chain-wide program, to encourage the traveler to bring along their favorite pet through the program we call Loews Loves Pets. Consumers' value equations are changing across categories including hospitality. They expect more for less money, and are getting it. How is Loews reacting? The consumer today is so well-educated and understanding of their specific needs that value can be delivered at any price point. For example, there are some consumers who are interested in getting a $100 room per night who also expect $100 worth of value. But as this global expansion continues in our industry, there are those consumers who are willing to pay $500 to $600 a night for their room and also want a specific return in value. As a value proposition is really in the mind of a particular traveler, it is incumbent on us to offer that value or even expand on that value when someone stays at a Loews Hotel. While price is an element, customers can differentiate between price and value. They understand that a great customer experience adds value and are willing to pay a premium for it. There are so many travelers aware of what’s cool, hip and chic who are going to college and shopping at the Gap and going to Ikea and Target that we are seeing a very well-educated consumer today who wants value, but once again that value might be at a very different price point. What are the various tools that Loews uses to monitor consumers and changes in the marketplace? Which are most valuable? How do you manage all of these tools? How do you transfer the insights to the organization? How do you keep the process fresh? We ask our senior managers to always be aware of what they are hearing in their lobbies and hallways. We also seek out customer feedback, and really try to monitor the trends in the industry. It also comes from my extensive traveling, seeing what our competitors are doing and reading lots of trade magazines, online publications and blogs. General consumer publications are also helpful, in terms of where the traveler wants to be located and which amenities she desires. We also do a variety of focus groups, in addition to requesting direct feedback, which we have now migrated to doing electronically because the consumer is much more comfortable filling out a questionnaire with a few clicks than using a pen. With these methods in place, we have a pretty good idea of what the consumer wants. Quite candidly, one of our challenges is that with only 18 properties we do not have representation in all major U.S. cities. The individual guest or meeting planner who is happy with a Loews hotel might want to use one of our properties in a city in which we’re not represented – it is a bit frustrating for us because we are very proud of the Loews Hotels brand and our record for serving the needs of our customers independent of locality. Wow! Great food for thought. Thank you, Jonathan! Thanks, too, to Rachelle Lacroix of Fleishman-Hillard. Chocolates On The Pillow Aren't Enough: Blog Book Tour and her podcast interview with Jonathan addressing touch points, Living Loews, partnerships, the criticality of human interactions, and other valuable nuggets. Now that you've experienced Chocolates On The Pillow Aren't Enough, are YOU ready to reinvent your customer experience? Have you taken advantage of these unbelievable opportunities to stretch your mind so as to figure out new ways to truly enhance the experience you offer your customers? Happy June 1st! Just in time for BlogTipping Day as proclaimed by Easton Ellsworth of Business BlogWire in Announcement: May 1, 2006 will be blogtipping day! This month's BlogTipping relates to the customer experience. The questions and thoughts below force soul-searching and honest assessment. + Stephanie Weaver wonders Do people care about "customer experience" yet? It looks like we've only just begun. + Greg Verdino asks Do you make your customers uncomfortable? and says "It is our obligation to see each and every action through our customers's eyes and do what we can to make them feel comfortable. Comfortable doing business with our companies, supporting our brands, with the product choices they've made. " How comfortable are you to do business with? + If you're not quite sure, then watch this video clip on David Armano's Logic & Emotion titled Breaking Up with Advertising. It puts into perspective our traditional methods of pushing a message onto the consumer. + Techno//Marketer Matt Dickman explains the benefits of Web 2.0 for Marketers:It's the community, stupid! "Web 2.0 is...about leveraging communities around your brand to add value to you customers." It amplifies the interaction, making mass communications look flat and oh-so-limited in comparison. + David also discusses Creating Compassionate Designers. Regardless of the field you operate in, read this article. It applies to all of us who truly believe in creating a meaningful customer experience. + Alan Thys captures his thoughts on How to delight your customers (10 thoughts). Anyone have additions to this list? + Tom Vander Well asks Do You Leave the "Customer" Out of "Customer Service?" What are you measuring? Does it really matter? "What is really important to the long term success of your business is knowing what YOUR customers expect and then meeting/exceeding those expectations." + Maria Palma brings up The One Thing That Scares Customers Away... Indifference. Avoid it at all costs. On the retail experience front, Conversation Agent, Valeria Maltoni, shares No Advertising... And Thriving, Retail Style describing Anthropologie's non-traditional approach to retail. Here, too, passion for the consumer's experience matters. I frequently refer to Anthropologie in presentations, given how unique their approach to retail. If you don't know them, then do so immediately. + Steve Woodruff from StickyFigure for creating the Marketing Bloggers Portal and organizing the many terrific marketing blogs into such a user-friendly format. + Marijean Jaggers from StlWorkingMom has been working on a fantastic project about Helping the Homeless in Charlottesville. Every one of your customers has a voice. Are you listening?